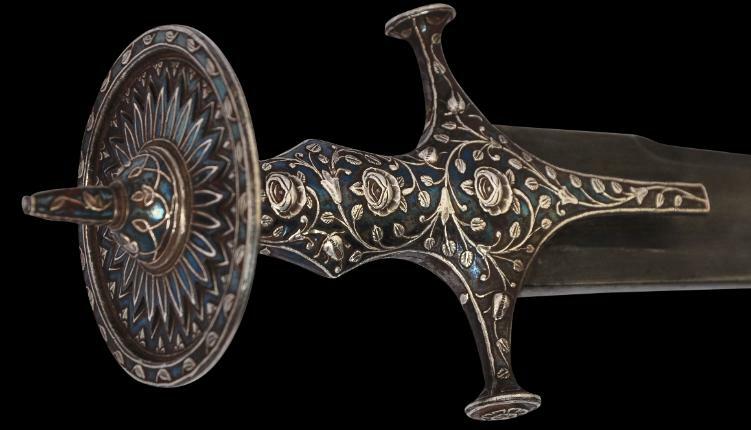 This beautiful tulwar has an Indian-made blued-steel blade stamped with a trisular maker’s mark, and the original black leather scabbard with silver mounts. 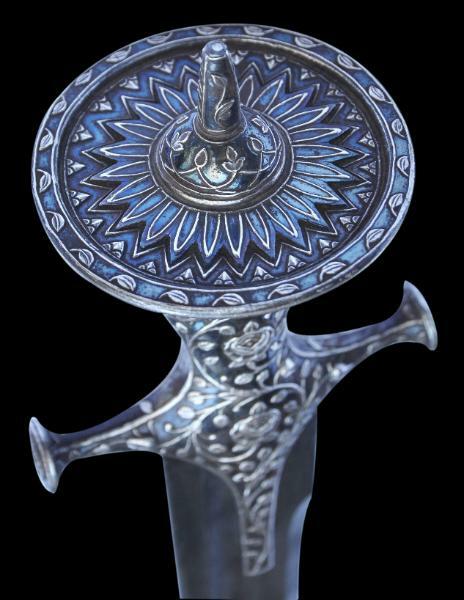 zarneshan silver work. 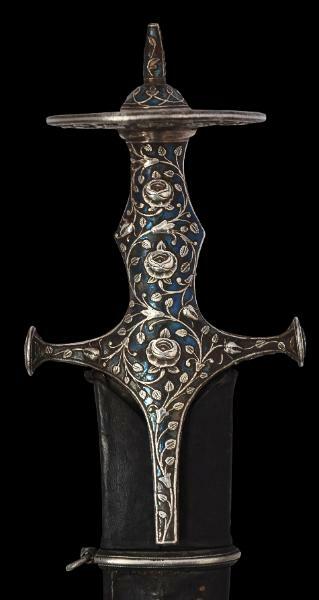 On one side, the hilt is decorated with roses; on the other with Ottoman-inspired pinks (similar to carnations). 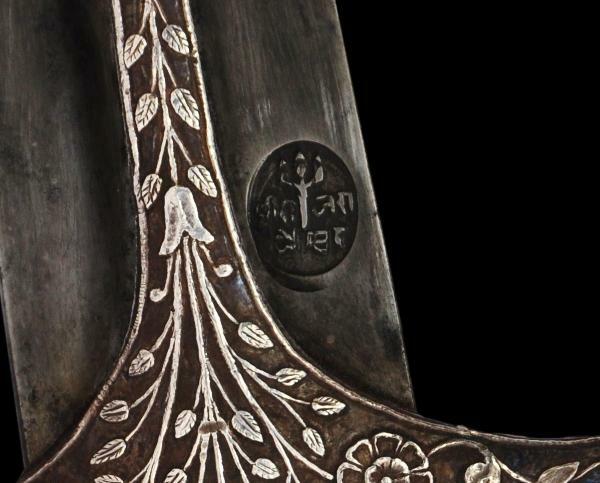 A degree of stylisation of the flower pattern is evident but the rose blooms particularly are naturalistically rendered in the manner favoured by the Mughals. 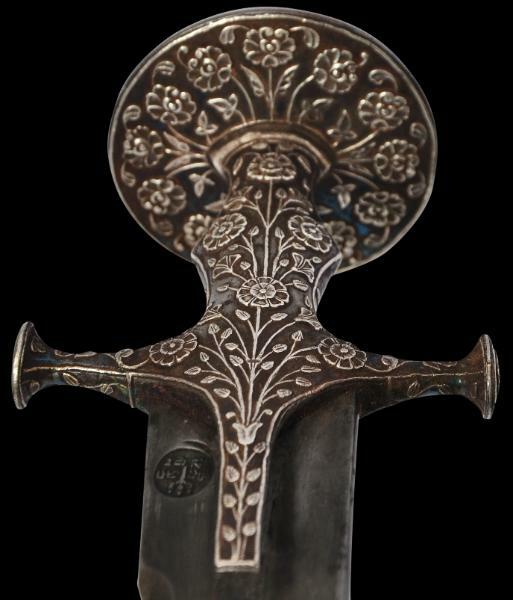 Single flowerheads embellish the ends of the cross guards. 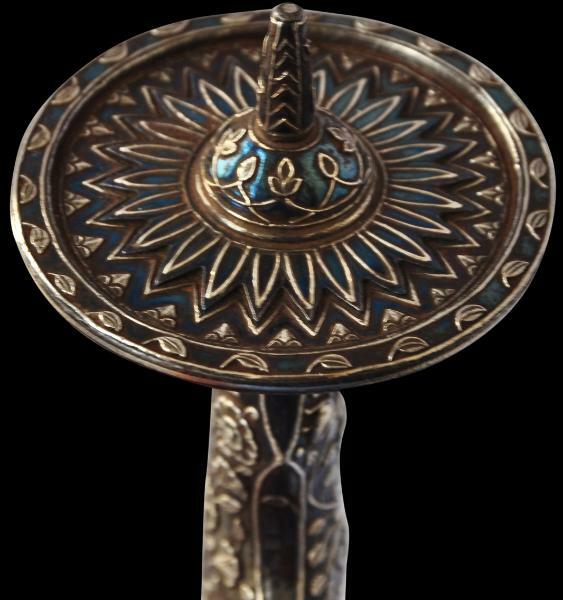 The circular wide-rimmed pommel is decorated underneath with pinks and on top with a broad petal design. 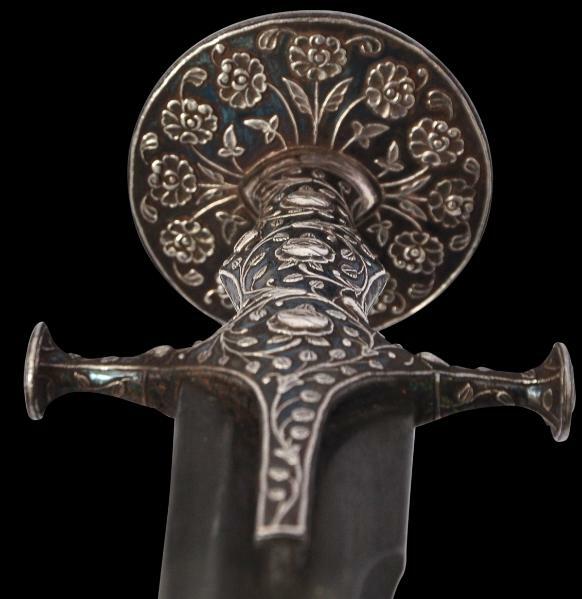 The pommel finial is inlaid with flowerheads and wisps of foliage. 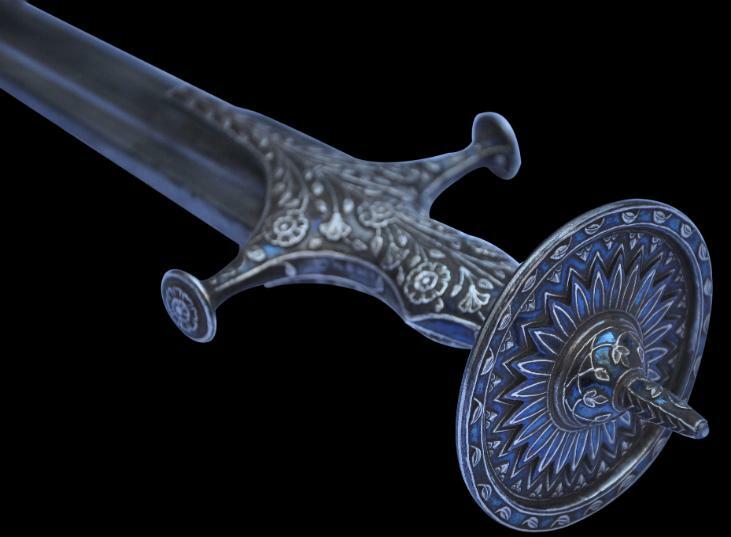 zarneshan technique involves the inlay of gold or silver threads into an etched surface. They are the hammered down but still standing proud of the steel surface. 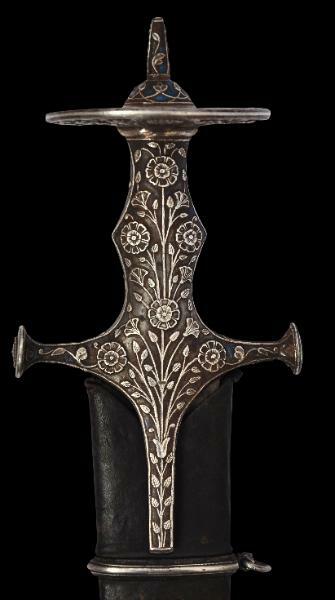 The gold or silver can them be further worked with engraving to produce a highly tactile surface. The steel is then blued or blackened to provide a decorative contrast. zarneshan technique is illustrated in Spink (1997, p.16). 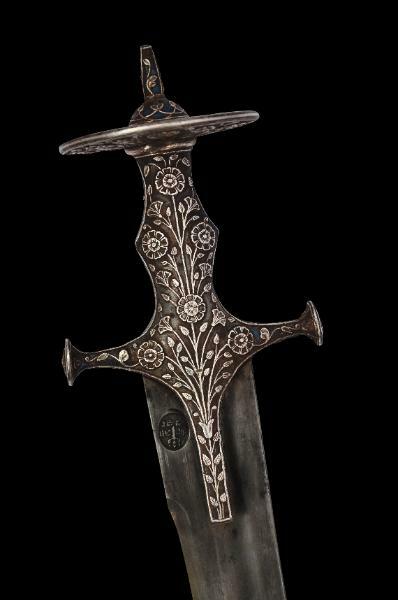 The example here is in fine condition with no losses to the silver inlay. 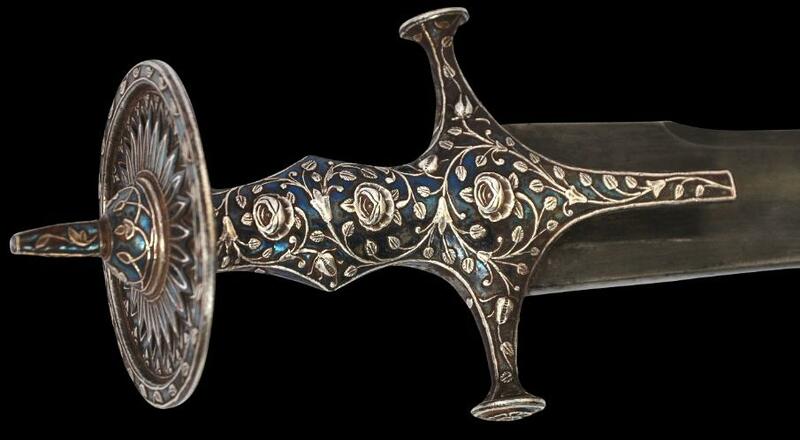 It has a good weight in the hand and the work on the handle is particularly pleasing. Spink, Splendours of the East: Indian & Islamic Works of Art, 1997, p. 16. Detail of the impressed trisular forge mark.